Soon the classic KONG line will include a teeny-tiny KONG made especially for toy-sized dogs. They’ll be on the market in April, but take my word for it… They could NOT be cuter. Seriously. They look just like the others, but very, very small. I bet they hold about a tablespoon of food, and that’s it. These piles of raw rubber become the KONG classic dog toys. 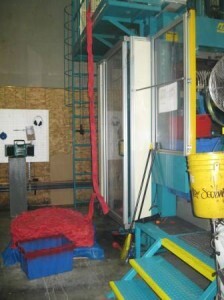 The raw rubber gets fed up into the machines that make the classic KONG shaped dog toys. 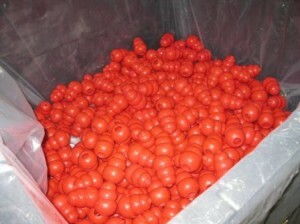 Once the rubber is melted, molded, and set ... it becomes KONG dog toys like these. Lilly says, "Thanks, KONG, for the new stuff!" 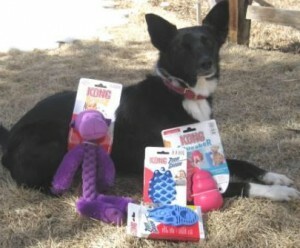 We’re currently working on dog product reviews of these items the KONG folks were nice enough to give us. So, watch for those in the coming weeks. I even got to see some brand new KONG products, but they won’t be available for a while, so I cannot talk about them or test them … yet. Hello my name is Patricia Wood & my husband Bill invented PetWaste-A-Way® we are tyring to get it licensed & thought you might find it interesting. We have spent about seventy thousand dollars getting this far, unfortunately we have run out of money. 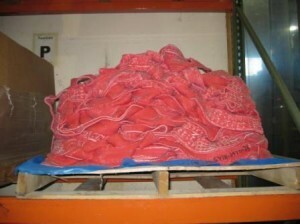 PetWaste-A-Way® has huge potential with over forty million dogs in America. We hope you too see there is a huge market in PetWaste-A-Way® . Thank you for your time. PetWaste-A-Way® liquefies dog waste where the dog leaves it in just seconds and puts it into the soil. No more having to scoop, bend, or pick the poop up and put the dog’s poop into a plastic bag. There are over 37 million homes in America with more then one dog. That’s a lot of dog waste. PetWaste-A-Way® is environmentally friendly, no harmful chemicals needed to liquefy the waste away and less plastic bags in the landfills. PetWaste-A-Way® has two patente’s and is registered trademarked. PetWaste-A-Way® has two working prototypes, one a rechargeable battery operated unit the other a gas operated unit. PetWaste-A-Way® will be sold not only in pet care stores but also lawn and garden and where ever tools are sold. PetWaste-A-Way’s® our consumers are the 37 million dog lovers that hate the bacteria filled poop they leave behind and doggie day care’s, hotel’s, motels, apartments with dogs, businesses that let their employees bring their dogs to work, any where dogs are aloud. We have even heard from teenagers that thought PetWaste-A-Way® would be a great first business for them. PetWaste-A-Way® will have repeat business in two different ways. PetWaste-A-Way® had a market annalist say 40 percent of the 37.7 million homes would buy it. We have a lot more information if you too see the huge potential in PetWaste-A-Way® please contact us. Hope You Have A Poop-Free Day !! 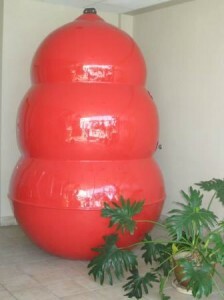 Love the giant Kong! Bet those teeny tine Kongs would make a good keychain! LOL! KONG do have mini kongs that already are on a keyring! We love kongs around here. I think that we own 2 dozen. The only problem is that we’re finding that the red ones eventually start cracking and breaking when we repeatedly freeze food in them… So, we’re helping to keep Kong in business as we replace them! You are right, KB. The freezing and all that does wear down the rubber over time. We have a really old KONG from Ginko’s puppyhood that has seen better days. I should probably just get rid of it. That Kong sculpture is truly funny. I always thought they were such a strange shape! Eagerly await the review of the new products. Can anything beat the classic kong? That’s what I think, Melanie. They were showing all the 200+ KONG products available now, including some coming on the market soon, and I’m still just a SUPER FAN of the original. My dogs just don’t really have interest in many of the newer toys.